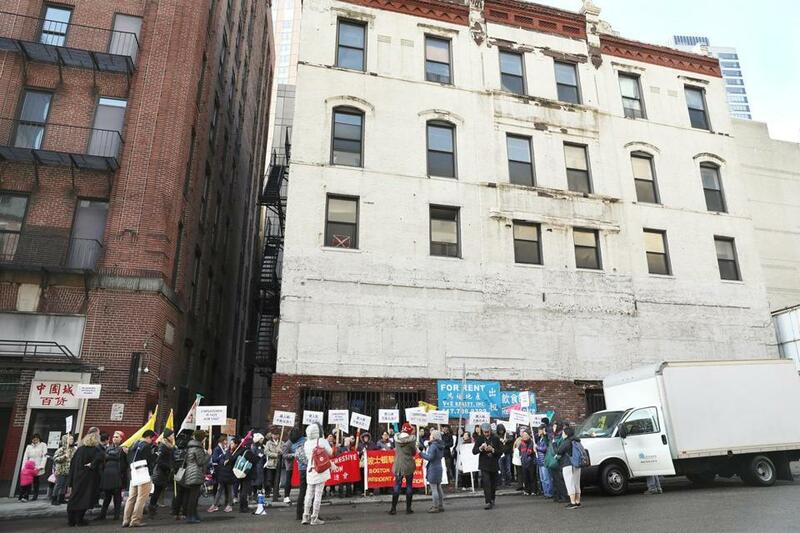 Protesters spoke out against a planned hotel on Harrison Avenue in Chinatown on Wednesday. Boston’s Chinatown neighborhood, the last immigrant enclave in the heart of the city, has been under siege from the building boom that has swept the city with glittering luxury towers and the gentrification that comes with them. Now residents say they are facing a new threat: hotels. Developers have proposed three more hotels in Chinatown on dilapidated or underutilized properties, among them a former rooming house on 25 Harrison Avenue that was abruptly evacuated one night five years ago after the building was found to be structurally unsound. “There are three hotel proposals in Chinatown right now at the same time we’re having this housing crisis,” said Lydia Lowe, co-director of the Chinese Progressive Association, which organized a protest Wednesday afternoon outside the Harrison Avenue property to draw attention to the neighborhood’s need for affordable housing. Property owner and developer Sing Ming Chan and his representatives met with various neighborhood groups and organizations last year to pitch a 26-story, 132-room hotel on the property, which deeds records indicate he purchased in 2014 for nearly $5 million. Chan could not be reached for comment, and his attorneys did not return calls for comment. Two other hotels have been proposed in the neighborhood. A proposal for a 17-story hotel with 250 rooms on 73-79 Essex St., on the corner of Oxford Street, is under review by the Boston Planning and Development Agency. Another proposal, presented to neighborhood groups last year by the owner of East Ocean City restaurant, would add four stories above the restaurant building on 25 Beach St. for a hotel with up to 85 rooms. Both the Harrison Avenue and Beach Street proposals have sought feedback from BPDA, but have not submitted plans, said Jonathan Greeley, director of development at the agency. Greeley said the agency and Mayor Martin J. Walsh’s administration are “taking very seriously the development pressures of Chinatown,” and that they’re trying to balance those challenges with a commitment to increasing affordable housing, such as the seven affordable units slated for the PBX Residences on the former Verizon building on Harrison. Despite the building boom around the neighborhood, city officials boast they have increased the overall percentage of affordable housing in Chinatown. Chinatown residents recognize those efforts, Lowe said. But in a neighborhood in the shadows of Millennium Tower, with its multimillion dollar penthouses, and other luxury housing, Lowe said many residents fear “it’s almost too late” to save Chinatown. 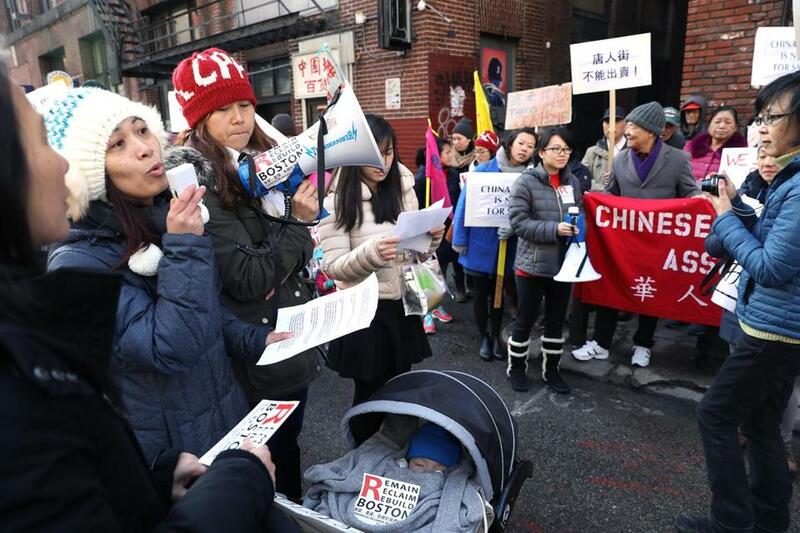 She said many Chinatown residents are counting on a series of tenant protections pushed by Walsh that would, among other things, protect renters from evictions in certain circumstances and bar landlords from clearing entire buildings of tenants in one swoop. Correction: This story has been updated to reflect the correct number of affordable units at the PBX Residences.